Steven (Chicagoland, United States) on 25 June 2018 in Landscape & Rural and Portfolio. Shadows dance in the rough of the first fairway. The rolling mounds with the surrounding sand traps is the eighth green. The pin (hole) lines up with the tree on the far right in front of the trunk. Photo captured May 22, 2018. Wow - Steven - how beautiful is that! Gorgeous colors and composition! Des couleurs merveilleuses. Un cliché agréable. A golfer's dream course, I'm sure, Steven. Very lovely, Steven. Must be expensive to golf here. Que c'est beau ces arbres aux couleurs diversifiées sur cette herbe vert tendre. What magnificent colours nature offers. Are you a golfer? A very beautiful place For golf lovers, a special place, I suppose. Bonjour Steven, quel endroit magnifique, c'est tout beau! Bise, bon lundi tout en douceur! Very beautiful ! Splendid colors ! Stunning! I love the warm light and rich colors. 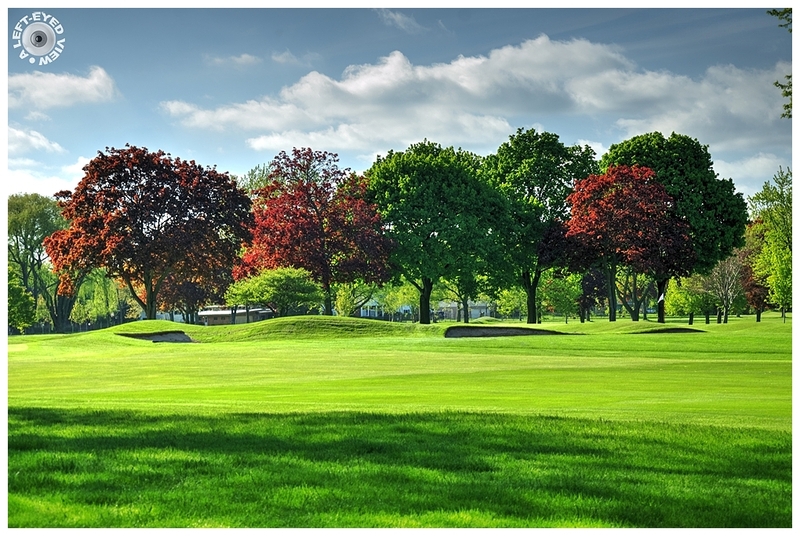 Beautiful golf course and also so colorful with the trees. A nicely composed picture of this golf course. Excellent capture of the vivid greens and that trees. The beauty of the shadows and the colors, in this immensity of green. So soothing to the eyes. This is a spectacular view. Gorgeous color! What a fabulous golf course! I love the rolling green hills in this pretty fairway. Glorious view it is! Love the rich colour tones and your composition as well. Ces taches d'arbres rouge dans ce vert génail. Belles ondulations à l'ombre des arbres qui ressemblent aux érables de mon jardin.